Greater space and higher read/write speed, unlock your device potential and support 4K UHD video. 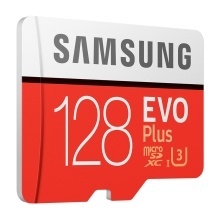 Samsung EVO Plus+ memory card, with amazing performance and reliability, lets you collect colorful life pieces. Can record and play 4K UHD video, with up to 100MB/S reading speed, meeting your speed requirements. Don&apos;t worry about space, 32GB/64GB/128GB/256GB, whichever you choose.Large capacity allows you to move forward freely. Waterproof, X-ray proof, magnetic proof, can also work in harsh environment. Balance performance to improve your mobile experience. Allows you to transfer video to your laptop in a very short time and share it quickly. Compatible device: Smartphone, tablet, sports camera, automobile data recorder,etc.